A common business quote is “busy is good”. And busy is good! Being busy usually means a business is earning money. In the same way, fleets want more workload because that leads to higher income. 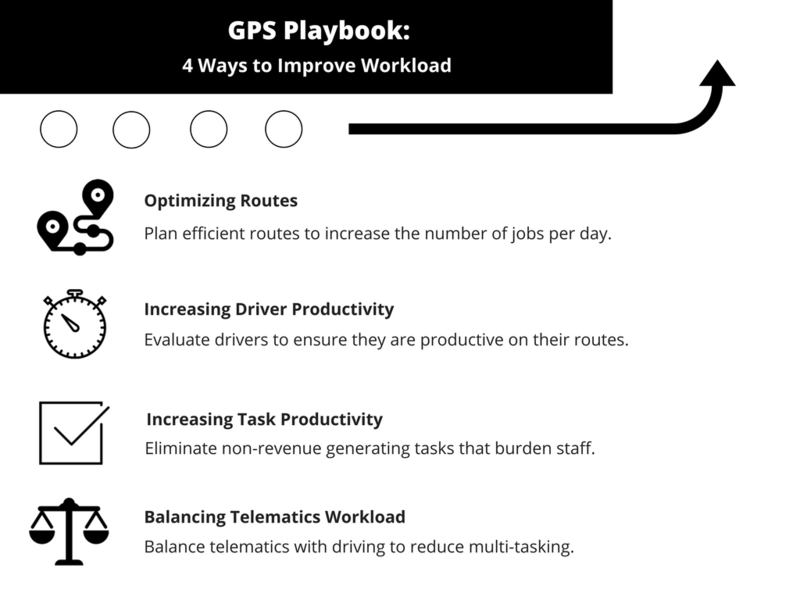 In this guide, we will cover 4 ways to improve workload with GPS trackers. The first way to improve workload with GPS trackers is to look at route optimization. Route optimization means planning out the best route and increasing the number of jobs per day. Firstly, managers would look at different factors to determine job routes. This can include distance from jobs, traffic, weather, and customer preferences. Thankfully, GPS programs are powerful enough to calculate routes based on all of those factors. Secondly, routes are shared with drivers. For a long time, managers sent emails or texts to drivers. However, modern fleet setups now include an in-vehicle navigation guide. For example, some companies have in-vehicle tablets and display routes on those tablets. As a result of these two steps, managers can squeeze more jobs out of a day. Another way to improve workload with GPS trackers is to focus on job efficiency. In other words, are drivers productive on their current routes? Besides looking at driver productivity, another area is task productivity. Are employees spending their time on tasks that generate revenue for the business? One idea is to use automated paperless software. For instance, some businesses use a computerized inspection system. Computerized programs collect diagnostics data from the vehicle and auto-fills inspection forms. Therefore, employees can go straight to the job rather than doing paperwork. Finally, is it always useful to use telematics? The answer is actually no. There are times when GPS trackers can burden drivers. Recently, there was an academic study on drivers that got in accidents because of telematics. 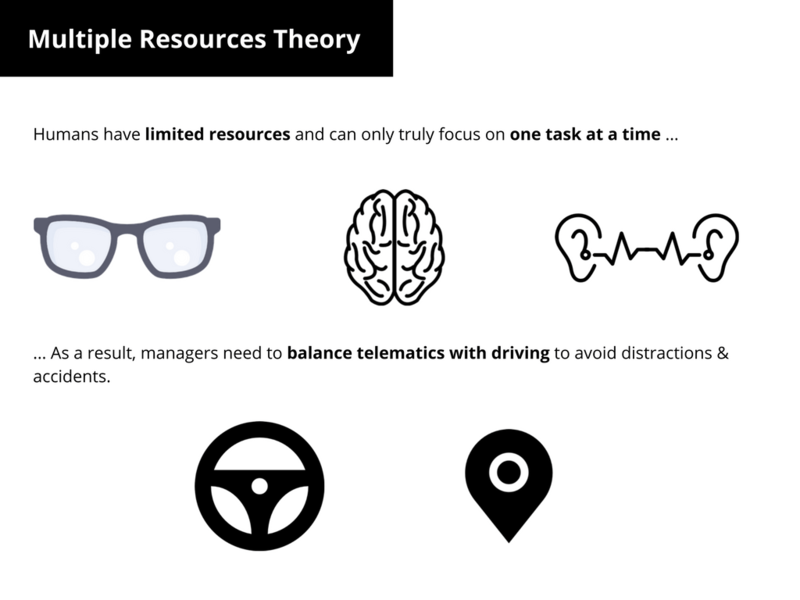 The study refers to the “Multiple Resource Theory”, which states that humans only have enough visual, cognitive, and manual resources to focus on one task at a time. In other words, some drivers get distracted by their telematics system. For example, some systems might have audio alerts whenever a manager assigns drivers a new job. The first instinct for some drivers is to check their notifications. Unfortunately, during that time, the driver stops focusing on the road and increases their risk of getting in an accident. What’s the lesson? Businesses should learn to balance telematics and driving. For example, some businesses set up their system to only alert drivers of new jobs when their vehicle is stopped. 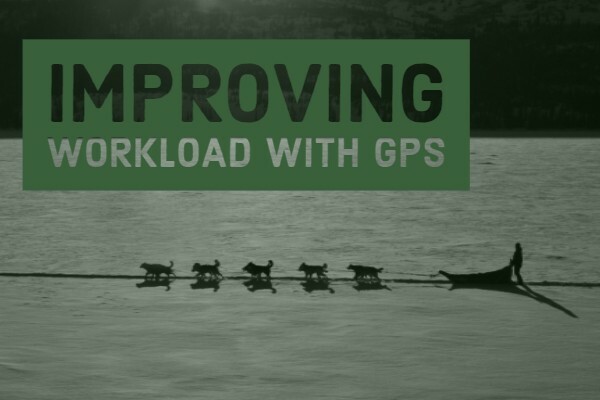 Click here for another article about improving workload with GPS trackers!